The Argentine SAOCOM (Satélite Argentino de Observación Con Microondas) constellation comprises two L-band SAR satellites. The mission is headed by CONAE. INVAP is the prime contractor for the design and construction of the SAOCOM-1 spacecraft and its SAR payload, currently under development. 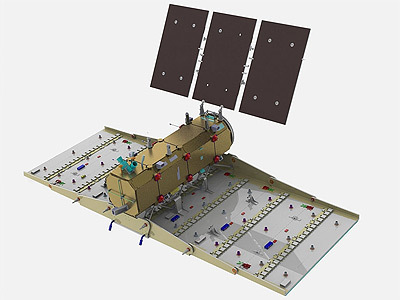 The SAOCOM-1 spacecraft will benefit from the heritage of the SAC-C spacecraft platform. Synthetic Aperture Radar (SAR-L), an L-Band instrument featuring standard, high resolution and global coverage operational modes with resolution ranging from 7 m to 100 m, and swath within 50 km to 400 km. It features a dedicated high capacity Solid State Recorder (50 to 100 Gbits) for image storage, and a high bit rate downlink system (two X-band channels at 150 Mbits/s each). The SAOCOM system will operate jointly with the Italian COSMO-SkyMed constellation in X-band to provide frequent information relevant for emergency management. This approach of a two SAOCom and a four COSMO-SkyMed spacecraft configuration offers an effective means of a twice-daily coverage capability. By joining forces, both agencies will be able to generate SAR products in X-band and in L-band for their customers. SpaceX was contracted in 2009 to launch the satellites in 2012 and 2013, but the first launch was delayed to October 2018.